Paul Schneiter – percussionist for MenWhoPause and ethno grunge groover. Drumming since his hands could hold sticks, Paul recorded his first song when he was only twelve, and went on to become a producer in Paris before moving to India three years ago. Since then he has toured this beautiful country as a sound engineer and currently plays the drums with Delhi’s MenWhoPause and that fabulous voice of Delhi TRITHA. Paul has also worked with Indian bands Advaita, Faridkot, SPACE and Indigo Children. Tonight he’ll be playing the cajon (the ‘j’ is pronounced like the urdu ‘kh’) with some latin beats from the cooler end of the American continent. Georgie Pope – harpist and founder of Sound Travels. Georgie’s played the harp since she was seven… plucking away like an angel until she discovered latin harp – when her style turned a little more devilish. She’s performed with the likes of Susheela Raman, Duncan Bridgman, Kutle Khan, Nathoo Lal Solanki, Krupa, Diego Laverde, Jason Singh Sina and a whole host of other fabulous musicians from different musical traditions and backgrounds. In our tireless quest to showcase the very best of traditional Indian musical talent, once again we bring you the inimitable folk legend Kutle Khan for an evening of soul stirring rhythms and melodies, all on the terrace overlooking the lake at Boheme, Hauz Khas Village. Kutle will be jamming Sufi and foot-tapping Rajasthani folk fused with the melodic accompaniment of American guitarist Brian Citro and British harp fairy Georgie Pope. Back by popular demand… we are privileged to present Kutle Khan with his talented band Rajasthan Rocks, in an exclusive Sound Travels Session for Shalom. An extremely talented and charismatic performer, Kutle Khan is the rising star of Jaisalmer district, Rajasthan. He sings popular, devotional and folk songs, plays every percussion instrument he can lay his hands on, and is a master of the morchang, bhapang, dholak and khartals. He has stunned audiences throughout India as well as in over fifty countries worldwide. Not far beyond Delhi’s cacophony of horns, barking dogs and firecrackers there lies a lake as still as glass. The barbeque crackles, the nagara drums roll and a concert of Rajasthani music is about to begin. Just as soon as we can get you all down to the party. 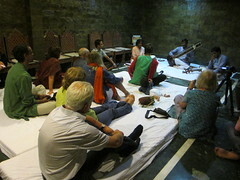 Join us on an Escape Delhi / Sound Travels weekend in the foothills of the Aravalli Mountains . It’s a short drive and boat trip from Delhi and we’ll camp in old-style desert tents, dance to drums, morchang and khartals round the campfire, and we’ll eat and drink to our hearts delight. Amongst the musicians performing, the star of the show is one Nathoo Lal Solanki – the world-touring, magnetic and incredibly talented nagara player who appears on Susheela Raman’s latest album Vel and has graced the Sydney Opera House, the Queen Elizabeth Hall, London, the Lincoln Centre in New York to name but a few. Georgie Pope will play the harp and encourages anyone who plays an instrument or sings to join in the jam. Sound Travels Sessions are extremely excited to present Jumma ‘Yogi’ Khan – the witty and provocative musicians and poet from Alwar. 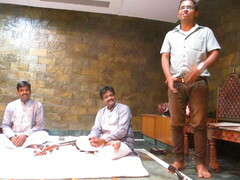 Accompanied by his bhapang – a percussive one-string instrument – Jumma sings stories and ballads that commentate on modern India and traditional themes. He’s very funny, he plays with language (Hindi, Rajasthani, Gujurati and a smattering of English) and he’s a rhythmic genius… so there will be dancing. He’s also been known to ruffle some feathers. In fact, some governmental organisations have banned him from performing because he’s too cheeky. Who: Kusumakar Pandya is a classically trained bansuri (Indian flute) player who has collaborated and performed with artists from all over the world. Equally at home with folk and classical styles, on Tuesday he will be performing dreamy raags accompanied by harp and percussion. There are few singers like Roshani Nayak. Her powerful and sweet folk-style voice is celebrated throughout Rajasthan. 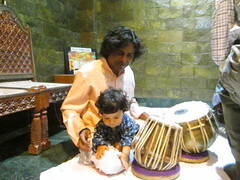 She’ll be singing folk songs and devotional bhajans accompanied by the dholak (twin-faced drum) and manjira (bells). We’re excited to be presenting her in Delhi for the very first time. Entry is free. This event is organised in partnership with the Escape Delhi team. The first session kicks off on Tuesday 6th September at TLR, with charismatic Rajasthani multi-instrumentalist Kutle Khan singing and playing the soul-soaring music of Jaisalmer, supported by Iranian percussionist Fakhroddin Ghaffari and harpist Georgie Pope. This event is organised in partnership with the Escape Delhi team.